A little bit of history The Pen Shop have been going since 1858 or thereabouts, but it didn’t quite take that long to produce this meta-review. In fact, we’ve already reviewed the younger sibling of the Dex and it passed with flying colours, so to follow-up the Pen Shop profile from last week it was the natural place to go next. How it looks Nicely rounded. It’s a straightforward, simple and pretty classic shape. So it immediately competes with the styling of many popular pens, and that’s a good thing – it looks like a fountain pen ought to. The body is made by Helit, who own the Diplomat brand – so they know their stuff. How it feels Warm and nicely textured; it’s light plastic, and not especially squishy but it does indeed feel fairly ‘soft’. How it fills This is one of those designs which takes two small ‘international’ cartridges, and indeed two are provided with each pen – but it will also thandle a converter quite comfortably. NB long Waterman cartridges have a bit of a habit of getting stuck. Crucially, how it writes… Tucked-away into that plain black section is a Bock nib, and the standard M is a real treat, as you’d expect from the same stable as Diplomat really. It readily competes with any other similarly-priced starter pen, and at least two of our reviewing team have had one ‘borrowed’ by our better halves because it wrote so nicely. F, B italic and left-handed nibs are also available, but at the moment only in person at Pen Shop branches – a bit less convenient, but it does make it easier to make sure you get a nice smooth one again. A prototype purple nib also came our way; there’s no word yet on whether that’s joining the range, but it’s getting lots of attention already. There’s also a left-handed nib (presumably known as the Sin). Pen! What is it good for? 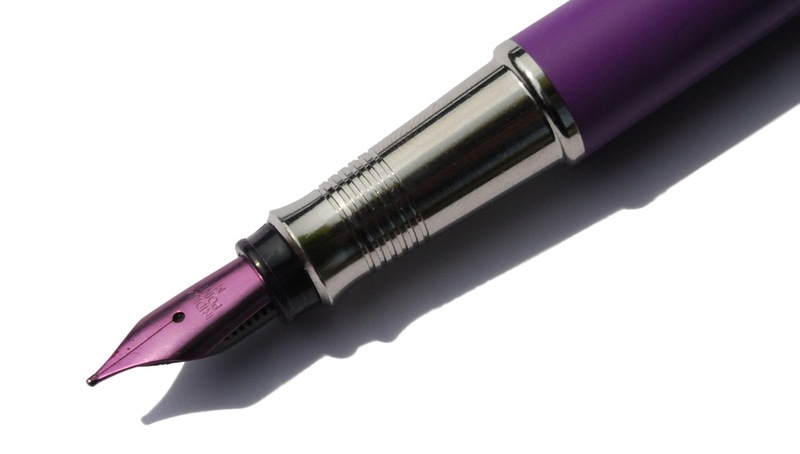 We’re often asked (particularly via the Fountain Pens UK Facebook group) for starter pen recommendations, and usually the same two stand-by solutions come up; the Lamy Safari and the Pilot MR (or Metropolitan, in some markets). But this as Rob pointed out in his comprehensive review (link below), that’s a hotly-contested niche, and to it we now need to add the Dex. The standard Dex M nib is impressively smooth, it looks good and is uncomplicated to use, it’s cheaper by far than the MR, and unlike the Safari uses cartridges which are available everywhere. That’s not to say that the other two are bad pens – far from it – but this is arguably a safer, and more interesting, place to start. The Dex is robust enough to put up with some demanding professional purposes, too – and has been seen marking huge piles of homework, for instance. VFM The big Dex is extremely good value for money at £12, and exceeds in quality anything you’re likely to find in a high street stationery shop for that sort of money. It’s not a luxury pen, of course, and you may find the odd bit of extruded plastic which needs smoothing-off or even, very occasionally, a less than perfect nib, but the key strength is that despite being a budget pen it’s backed up by strong customer service; if you’re unlucky and a duffer gets through, The Pen Shop just whizz into action and replace it without further ado. The range of colours has something for all tastes, and to get a good Bock nib at this price is definitely not to be sneezed at. If this isn’t quite your cup of tea, but almost… Well, if the medium-sized proportions of the Dex by Kingsley Plum Smooth Soft Fountain Pen don’t appeal – even if it takes the best part of a week to say the name out loud – you could try the shorter Dex by Kingsley Purple Compact Soft Fountain Pen. The names could perhaps do with some shortening too, but essentially it’s the same proposition in a slightly more compact body. 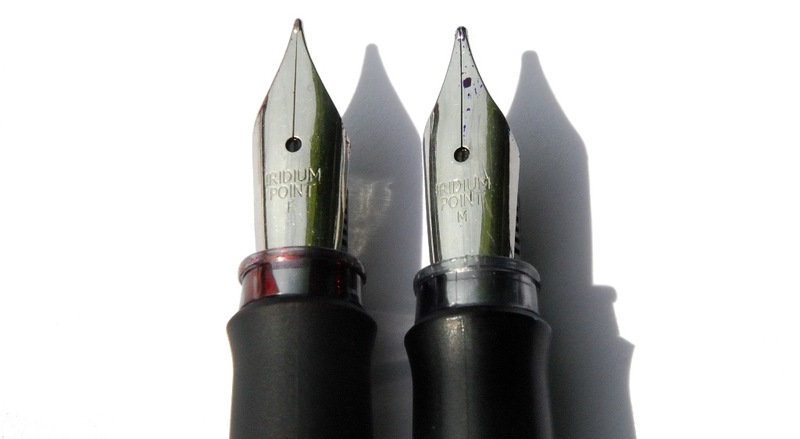 If you like either size of Dex but fancy a different nib, work is under way to make that possible, we’re told; it’s a pity that swaps can only be carried-out at Pen Shop shops at the moment, but on the plus side at least there’s no extra charge for the service. Our overall recommendation For this money, you can’t go wrong really. For the person in your life who finds your interest in fountain pens hard to understand, this is a simple way to reel them in. Where to get hold of one From a branch of The Pen Shop, their website or the new Penwrite project, where there’s an introductory 10% discount offer at the moment. Thanks to Hannah and Louise at The Pen Shop for getting some Dex samples out to us. If you’d like to win one then Ian put together a tempting ‘starter kit’ including both sizes of Dex, with double the chance of winning by leaving comments before here and there. That competition has now closed, but Ruth is also giving one away via her Instagram channel! Great to see another good performing introductory pen. If comment was intended to be one of thanks as other entry, I repeat my thanks to my sister for always being available to support me. Thank you to my professor whose fountain pen inspired my love for fountain pens. I also appreciate him always listening and guiding me when I need help. This looks like just the pen for me – a newbie to the world of fountain pens. I’m drawn to pens and stationery that are brightly-colored, cheerful and bubbly!